This article regards urban planning as a form of storytelling and argues that there is significance in whose stories and which storylines are acknowledged to belong to the narrative fabric of a place and how the stories of future districts are communicated to the public through narratives during a planning project. My focus is on the storyline that follows the activity of graffiti culture in the two case areas of Santalahti and Hiedanranta (located in the city of Tampere in Finland) during these areas’ phases of transition created during the redevelopment of former industrial areas into residential districts. In my discursive analysis I identify key narratives that recur in planning, marketing, and news texts concerning the two case areas. These narratives are 1) Progress and Innovations, 2) The Old with the New, 3) The Warm, Welcoming Home, 4) Together with Communities, 5) Ruin and Despair, 6) Graffiti as Art and a Pastime, and 7) The Underground. The key narratives offer insight into the means by which the stories of the two future forms of the districts are distributed to the audience by various agents, the narratives that are dominant, and the degree to which the existence of the graffiti storyline is visible in them. There are two comparable post-industrial areas undergoing significant redevelopment and giving rise to diverse and diversely constructed narratives in the western region of the city of Tampere in Finland: Santalahti and Hiedanranta. Both areas have had industrial activity in the past, are currently in a process of being transitioned into residential districts and have a recent history of economic idleness. Although the areas have had small businesses and entrepreneurs working there during their idle state, there has been at least some inactivity and lack of maintenance of the buildings. This idleness has created an opening for temporary activities to occur in Santalahti and Hiedanranta, and enabled the birth of stories; in particular, a storyline formed around graffiti, which is the focus of my article. This storyline attaches to the active graffiti culture operating in both areas before and during the planning of the two remodeled districts. This empirical case study describes how the future forms of the districts of Santalahti and Hiedanranta are presented to the public through key narratives found in planning, marketing, and local newspaper texts. I ask which narratives are dominant. Is the graffiti storyline included in these narratives, and if it is, how? With narratives I refer to the intentional-communicative artefacts of storytelling. In the words of Gregory Currie, these artefacts “have as their function the communication of a story, which function they have by virtue of their makers’ intentions” (Currie 2010, 6). In turn, I view a story, essentially, as a sequence of events or experiences – or a presentation of a single one (Finnegan 1998, 9; Skalin 2008, 201). Finally, I use the concept of storyline to refer to a particular chain of events in order to differentiate various narrative threads within a story. My purpose is to bring forward the aspect of storytelling in urban planning and the importance of the narrative fabric of places under redevelopment. Mark Childs, in his article concerning how place stories can inform and condition urban design, gives stories high priority among the other vital features of a site: “Listening to stories of place can inform designers about the narrative fabric that is as much a critical part of the context of a site as the soil type” (Childs 2008, 184). When I use narrative fabric (as mentioned by Childs) I mean a composition of place stories such as everyday practices, experiences, and memories of dwellers, myths, novels, photographs, and newspaper articles produced of a place, and unbuilt designs produced during planning (Childs 2008, 175). The narrative fabric is especially interesting in the cases of Santalahti and Hiedanranta, as the first district has had to deal with multiple, clashing interpretations of the area and, in the planning of the second one, storytelling has been intentionally used as a participatory method to understand what kind of future district people are hoping for. My approach supports this issue’s theme of a city as a central stage for narration, where diverse visions and stories can guide the planning or challenge its ambitions and objectives, and thus shape the future of places in the city. My article draws on the studies concerning the relations of storytelling and planning (Mandelbaum 1991; Throgmorton 1993, 1996, 2003; Sandercock 1998, 2005; Forester 1999; Eckstein 2003; Childs 2008; van Dijk 2011; van Hulst 2012; Bulkens, Minca & Muzaini 2015), as well as studies of the temporary use of spaces (Haydn & Temel 2003; Groth & Corijn 2005; Doron 2010; Lehtovuori & Ruoppila 2012; Colomb 2012). I have intentionally made graffiti a protagonist in this article, as the storyline relating to it has not yet been properly analyzed in the context of the two case areas. Furthermore, my aim is to contribute to the discussion of contemporary graffiti and street art as cultural heritage (MacDowall 2006, 2017; Avery 2009; Kimvall 2013; Merrill 2014; Ylinen 2015; Alves 2017; Nomeikaite 2017). By referring to heritage, the studies suggest that, despite being a highly controversial culture of artistic expression, even graffiti belongs to the narrative fabric of the place it actively occurs in – and in some cases, it contains historical, artistic, or communal value worth discussing as a part of the area’s future. This raises another important question in my study: Whose stories and which storylines get to be told during an urban planning process? This article is divided into eight sections, including the introduction and the conclusion. In the following section, I will first explain how planning and storytelling are connected. After that, I will focus on the settings and the graffiti storylines of Santalahti and Hiedanranta, followed by a section in which I describe the research materials I have used in my analysis, and I explain the method of analysis. Finally, I describe the seven key narratives found in the planning, marketing, and newspaper texts concerning the two areas. In reporting the results particular attention will be devoted to how the graffiti storyline is present in the key narratives. To tell a story has been defined in the words of Lars-Åke Skalin as “to state that this or that sequence of events is an occurrence of this world, or of a possible world (fictional, hypothetical etc. ), in a past, present, or future time dimension” (Skalin 2008, 201). However, the relations between storytelling and planning require some further exploration. First, Merlijn van Hulst (2012, 302–303) has specified two models in which storytelling and planning practice work together: storytelling as a model for planning and storytelling as a model of planning. The former model positions storytelling as a contemporary method that can be used in planning practice for better understanding the narrative fabric of place. In her contribution to the authorship issues of planning stories, Barbara Eckstein noted that in many cases the stories used in a planning project belong to somebody else, for example, to communities and individuals who have shared their stories (Eckstein 2003, 21). Such stories are, for example, the ones told from within the graffiti scene in Santalahti and Hiedanranta. The storytelling methods used in a planning project allow the stories of communities, groups, and individuals to be made use of in urban planning in order to ensure that every stakeholder has been heard and listened to (see, e.g., Sandercock 2005). In extension to van Hulst’s models, Bulkens, Minca, and Muzaini considered storytelling as an act of resistance, as a way “to allow individuals affected by a spatial planning project to voice their concerns and their respective positions” (Bulkens, Minca, & Muzaini 2015, 2313–2314). Ideally, the storytelling methods enable planners and designers to utilize local knowledge and identify problems, which might offer solutions to conflicts in all stages of a process. Van Hulst’s second model positions planning itself as a way of storytelling, meaning that planning does not just make use of others’ stories but also produces its own ones. For John Forester (1999) the practice stories of planners are an effective way of learning about both others’ and one’s own work in the planning field, whereas James Throgmorton (1993; 1996; 2003) has famously argued that, to the core, planning is persuasive and constitutive storytelling about the future. From the perspective of the designs used in planning, Terry van Dijk adds that places undergoing development also gradually grow towards that told future (van Dijk 2011, 126). He also emphasizes that planning as storytelling is not only future-oriented but also about changing perceptions of what these places mean and are in the present time (van Dijk 2011, 134). To construct a persuasive story about the present and the future of a specific site, planners and designers connect multiple storylines concerning places and various aspects of that area. These storylines may be set in a past, present, or future time dimension and are transformed into narrative objects such as documents and designs and eventually a new plan. When presented to the public, the complete planning story, or some sections of it, will be interpreted in numerous ways depending on which storylines the planners have included in their story construction, the stories of which individuals and communities they are using, which audience will be receiving the story, and through which narratives they are delivering it. Some narratives have been born apart from the formal planning process, hence not all of them necessarily support the intended story constructed by planners and designers. In this study, I will also analyze texts produced by owners, developers, and marketing specialists of the properties and journalists of the local newspapers. In addition to planning practitioners, landowners, and property developers working on the redevelopment, journalists are important agents. They are, ideally, able to craft narratives that would otherwise be lacking by raising questions and perspectives the other two groups either cannot or will not raise, and thus they have the possibility to act as mediators between the city in charge of the planning, property developers in charge of the construction, the landowners, and the public. I argue that the informal narratives also contain constitutive elements of the narrative fabric of place. In the following section, I will describe the cases of Santalahti and Hiedanranta and their graffiti storyline, which emerged during a state of temporary use in both areas: outside the formal planning process in Santalahti and as a part of it in Hiedanranta. The city of Tampere is the third largest city in Finland, holding 228 274 inhabitants (as confirmed in May 2017 on their official website). The inland city between two lakes is the center of the Council of Tampere Region, located in Western Finland approximately 180 kilometers to the north-west from the capital Helsinki. Tampere was the main industrial city in Finland during the 19th century, and therefore its history lies heavily on its industrial heritage and working-class culture. The factory eras of Santalahti and Hiedanranta are both considered notable parts of Tampere’s industrial history from the late 19th to the early 20th century. The industrial use was the primary use of both areas in the past. After the factory era came to an end, the following economic idleness was accompanied by temporary activity in the area. This temporary use suggests a state that occurs between the former primary use(s) and the new primary use(s) that are to be achieved by the redevelopment of the area (Lehtovuori, Hentilä, & Bengs 2003; Lehtovuori & Ruoppila 2012). Typically, temporary use may appear in indeterminate spaces that seem to have been “left out of time and place” (Groth & Corijn 2005, 503) in contrast to their surrounding environment. Such spaces are, for example, empty lots, idle industrial areas, train yards, and spaces under bridges (see, e.g., Doron 2000). Both the Santalahti and Hiedanranta areas include such indeterminate spaces with a recent history of temporary use. I will view the two settings one by one. Santalahti is located two kilometers to the west from the city center, between a railroad and the lake Näsijärvi. In particular the eastern part of the Santalahti area comprises of historical factories, which made goods such as paper and matches in their time, as well as of warehouses and buildings associated with the industrial activity. The two former industrial blocks that are currently framed by the match factory, the paper factory, the bone meal factory, and the roofing felt factory are in unauthorized temporary use by urban subcultures, such as graffiti artists, skateboarders, photographers, and the young. 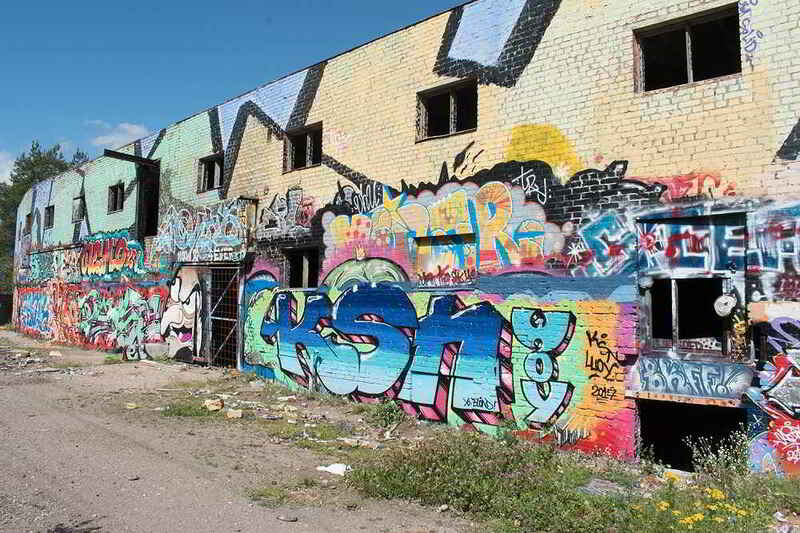 The graffiti storyline in the two factory blocks in Santalahti began uninvited in 1990s after all formal activity in the factory buildings had ceased. Over the two following decades the writers and artists gradually painted layers of graffiti pieces inside and out on all four factory buildings and their warehouses. The long wall on the other side of the railroad is also painted with graffiti and considered a hall of fame within the scene. Image 1. Several graffiti pieces on the southern façade of the roofing felt factory in Santalahti. Kai Ylinen 2017. Planners working on the Santalahti project employed the rational and systematic planning model in which storytelling methods were not used. The new master plan for transitioning Santalahti into a residential district was confirmed on 4 April 2017 after a 10-year planning process. It is estimated that the current population of 290 will increase to 2300 residents in the future. In the eastern part of the area, the graffiti-blooming match factory and the paper factory are protected in the master plan. In addition, the future tramline that is currently under development in the city of Tampere will run through Santalahti. The properties in Santalahti are owned by private developers. The new master plan for the Santalahti district was ordered from the City of Tampere by these actors. According to an email by Heli Toukoniemi, Land Use Manager of the City of Tampere, the city does not own any buildings in the area. The main property owners working on the development of the site are Pohjola Rakennus, YH Kodit, and Lemminkäinen, of which the first two stand behind branding and marketing the area as Uusi Santalahti (‘New Santalahti’). Image 2. A map of the New Santalahti, courtesy of Pohjola Rakennus and YH Kodit, sent by an email to the author by Tuire Mäenpää / YH Kodit. Hiedanranta is situated in western Tampere and is also on the shore of the lake Näsijärvi, four kilometers from the city center. It is connected to the busy commercial district of Lielahti and shares its eastern border, on the shore, with Santalahti. In Hiedanranta stands a former sulfite cellulose factory, later owned by Metsä Board (previously M-Real), along with its extensions, several buildings for the factory staff, and the historical Lielahti mansion. The activity in the factory ended in 2008 and the City of Tampere bought the site from Metsä Board in 2014. The industrial environment was closed to the public until 2016. After opening the idle factory area, the City of Tampere has made various events and activities possible by renting facilities to citizens for intended and authorized temporary use, supporting the organization of events in the area. Under the name Temporary Hiedanranta, the area offers scopes for action to various parties, for example, to a café, a cultural center, craftspeople and artists (for them to establish studios), a skateboarding hall, and an open space for circus professionals and practitioners. The current graffiti and mural art visible in the area have been made in 2016 and 2017 in two legal art events held by the Tampere-based street art and graffiti organization Spraycankontrol. Image 3. A few of the graffiti and mural art pieces made in the event of Spraycankontrol ’17 in Hiedanranta. Kai Ylinen 2017. The planners of Hiedanranta have chosen a participatory planning approach to which storytelling methods have been central. The planning of Hiedanranta is still in process. 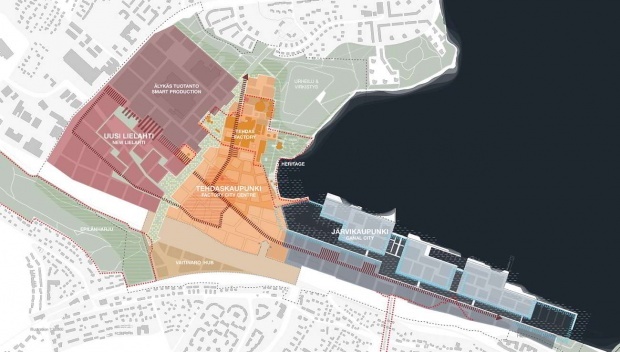 In the structure plan published in 2017, the future Hiedanranta is divided into three subareas, as shown in Image 4 below: 1) the Lielahti Hybrid District, an innovative part of the Lielahti commercial area, 2) the Factory City, consisting mainly of the post-industrial environment and the historical Lielahti Mansion area, and 3) the Canal City, a neighborhood in the shore zone of lake Näsijärvi, between the central marina and Santalahti marina. The district is anticipated to offer homes for 25 000 residents and new jobs for 10 000. Like in Santalahti, the future tramline will be operating in Hiedanranta. Image 4. A map of the future Hiedanranta showcasing the three neighborhood identities, courtesy of the City of Tampere, visible on the page 19 in the Structure Plan of Hiedanranta. This study includes three diverse types of research material from between 2013 and 2017, which is the period when both future forms of the districts have been planned and/or promoted to the public. First, planning texts include plans, reports, statements, and designs produced by planners, architects, other designers, or city officials. All in all, 49 items in this set were analyzed, excluding the various planning documents of Santalahti that were published before 2013, some of which are summarized in the final report. Thirty items belong to the planning texts of Santalahti and the remaining 19 to the planning texts of Hiedanranta. The second set of materials includes marketing texts, comprising of billboards, flyers, websites, promotional maps, and customer magazines (created by property owners, developers, advertising agencies, or marketing specialists). Eleven of the marketing texts target Santalahti and four Hiedanranta. The third set consists of news texts, including news articles about Santalahti or Hiedanranta from three local newspapers – Aamulehti, Moro, and Tamperelainen – published between 1 January 2013 and 20 September 2017. The articles in this category include only the newspapers’ journalistic content, meaning that all advertisements and letters to the editor were excluded. Thus, these texts are produced by journalists and those responsible for the paper’s editorial stance. These three papers were chosen for their content and distribution being central to Tampere. The news texts include 91 articles in total. Thirty-six of them cover Santalahti: 26 published in Aamulehti, nine in Moro, and one in Tamperelainen. Hiedanranta was the subject in 53 articles, 38 of which were published in Aamulehti, one in Moro, and 14 in Tamperelainen. In addition, two articles included both districts as their subject, one published in Aamulehti and the other one in Tamperelainen. It must be noted that although there seem to be less news articles about the Santalahti area, this is a result of the demarcation of this study. First, discussion about Santalahti began over ten years ago but the issues were selected to fit a timeframe in which narratives about both areas were active in the newspapers. Also, within the selected timeframe, more press releases were published about Hiedanranta as it is a newer development project, resulting in more articles on this district during the period. Second, the development of the Santalahti area is well documented, only the articles focus on the very specific processes active in the area, especially those concerning the long-planned and now built road tunnel and the future tramline. The articles that focus purely on these two major development projects in the city are excluded from the materials. My analysis is based on identifying the broad, recurrent key narratives present in the previously described materials. Often used in the narrative analysis of life stories, key narratives are produced as well-worn accounts that the author uses to explain and justify their actions and decisions (Phoenix 2008, 67). In addition, the focus of this analysis is on the content reading of narratives “as manifested in separate parts of the story, irrespective of the context of the complete story” (Lieblich, Tuval-Mashiach & Zilber 1998, 16). This means that not all key narratives appear in every text, and not all are intended to be part of the formal planning stories. As there also exists “repeated subject matter” (Phoenix 2008, 67) within the texts that focus on informal storylines, the key narratives found in them are as essential and constitutive to the narrative fabric of place as the ones found in texts presenting formal planning stories. By using this method of analysis, I am able to specify the most often used means of communicating the stories of the present and the future of Santalahti and Hiedanranta. I have identified seven key narratives that were recurrent in the planning, marketing, and news texts. The first four are future oriented: 1) Progress and Innovations, 2) The Old with the New, 3) The Home, and 4) Together with Communities. The remaining three depict the present of the areas: 5) Ruin and Despair, 6) Graffiti as Art and a Pastime, and 7) The Underground. All seven can be connected to the graffiti storyline in some way – at the very least, by the absence of it. The narratives are also the ones shared by all material types, with an exception of The Warm, Welcoming Home narrative that was missing from the news texts and the Ruin and Despair narrative that was missing from the marketing texts. Table 1. The number of texts in each key narrative, organized by the area and material type. Table 1 above shows how the key narratives are distributed between the two areas and the text types. As planning texts also contain comprehensive reports and compilations about all stages of the plan and marketing texts target the whole new district, one item can feature in multiple key narratives. There are also a few texts that did not contain any narrative elements. These texts are, for example, numeric tables, technical descriptions, forms, and purely descriptive items. All the following narratives are intertwined, and some of them are dependent of another. There is variety regarding which narratives are dominant in the presentations of each area, as seen in Figure 1 below. The most dominant key narratives in both are Progress and Innovations and The Old with the New that wholly support the intended planning stories. Along with The Warm, Welcoming Home narrative, recurrent mostly in marketing texts, the two last narratives where the graffiti storyline is visible through their original scene-based authors are minor ones. They are, however, also supporting the formal planning story of Hiedanranta, whereas in Santalahti, The Underground narrative in particular strictly opposes the official story constructed by planners and designers. The storyline authored by those acting from within the graffiti scene in Santalahti was never intended to be part of the area’s present or future by those working on planning. Instead, the planning story of Santalahti gets support from the highly visible Ruin and Despair narrative, even though a large number of stories delivered by this narrative are told by authors who are not working in planning. Figure 1. The division of narratives. These differences in dominant narratives are caused by three central factors. First, the planning methods are different. The planners in the Santalahti case relied on the rational planning model and the planners in Hiedanranta employed a participatory approach, which explains why the Together with Communities narrative is used so much more often in the texts of Hiedanranta. The second has to do with the ownership of land and properties. Unlike in Hiedanranta, the properties in Santalahti are owned by private actors. The ownership status sets distinctly different interests, objectives, and ambitions for the redevelopment of these areas, greatly affecting the kind of narratives that are dominant. The third factor is involved with the larger cultural context. It has to do with cultural shift regarding graffiti appreciation. Santalahti carries the weight of many years of unauthorized graffiti activity. Its narratives are weighted down by the idea of a wasted and ruined district ridden with crime: trespassing, arson, drug use, and graffiti (Ylinen 2015, 42–45). The graffiti in the area has, over the years, become the most often used means of depicting the unlawful nature of the area and the ruined state of its buildings. This narrative began during the period of zero tolerance of graffiti in the capital area of Finland and before the cultural shift regarding graffiti happened; and it has not changed since then. Hiedanranta does not have this weight of years. Its redevelopment began after the cultural shift regarding graffiti; the period of zero tolerance was over – graffiti, street art, and mural art were already being painted and legal graffiti walls were built all around the country. Graffiti had entered an era of being gallery-worthy art. These major distinctions are vital to understanding why the narratives are different in nature between the two areas. Next, I will go over all the seven key narratives. This narrative is present in all the material categories concerning both Santalahti and Hiedanranta. It is the most dominant narrative and there is no difference in how it has been used between the two areas. It supports the intended planning stories of the future and concentrates purely on the redevelopment of the areas. The texts describe both areas as new and modern districts, focusing on how many residents the area will hold or how many jobs the new facilities will offer. In the news texts, the narratives focus on describing plans and designs, such as visualizations and maps. The progress is seen to generally be welcomed by the city and its residents. It is shown by emphasizing cleverness, sustainability, and innovations. For example, in the guidelines for blocks in Santalahti (Seppänen and Villanen 2014), the innovativeness of Santalahti shows in its sustainability and renewable solutions. This is visible in the use of renewable energy sources, favoring wooden materials, supporting choices for public transport and cycling, and creating green-roofs that will be utilized in urban farming and recreational activities. This narrative always needs a foundation to which the progress and innovations are compared. The key narratives linked to these foundations are The Old with the New narrative, where the industrial history is seen as a resource, and the Ruin and Despair narrative, which is used as a contrast to a better future. The Old with the New is the second most used narrative in all the text types of both areas. It utilizes the past uses of Santalahti and Hiedanranta as a resource in building something new alongside the history. It focuses to the future instead of the past and especially emphasizes how the old buildings attached to industrial history are respectfully given a new life. The guidelines for blocks in Santalahti (Seppänen and Villanen 2014) state that the identifiable, modern building ensemble will honor the heritage of industrial building practice and will be based on the protected match factory. On their official websites, all the major property owners in Santalahti are promoting the protected buildings as a symbol of industrial history and as a quality part of the cityscape. Otherwise, and importantly, all else is new. The same message is visible on the flyer of New Santalahti, where the match factory is described as a natural combination of colorful industrial history and modern urban life, as seen in Image 5. Image 5. A section concerning the match factory area from the New Santalahti flyer. The chosen photograph also shows pieces of graffiti as an effect of mixing history with recent urbanity. In Hiedanranta, historical elements are also considered an essential part of the identity of the future district. In these visions, the old factory buildings are upgraded and renewed. The old industrial buildings are given a new purpose as “restaurants, exercise centers, and culture hubs” (Kalliosaari 2016). The designs, such as those shown in Image 6, show the historical factory buildings as “the heart of the city centre” and “[t]he development anchor of the area” (City of Tampere 2017c). Image 6. A visualization of the heart of the city center showcasing the shopping street and the future tram line among the industrial past. City of Tampere 2017. In one news article (Uusitalo 2017b) the protected buildings of Santalahti are all presented separately with pictures – both their past and their future primary uses are described. An old cardboard factory, for example, will likely be turned into loft apartments and the graffiti-blooming match factory might become a daycare center. 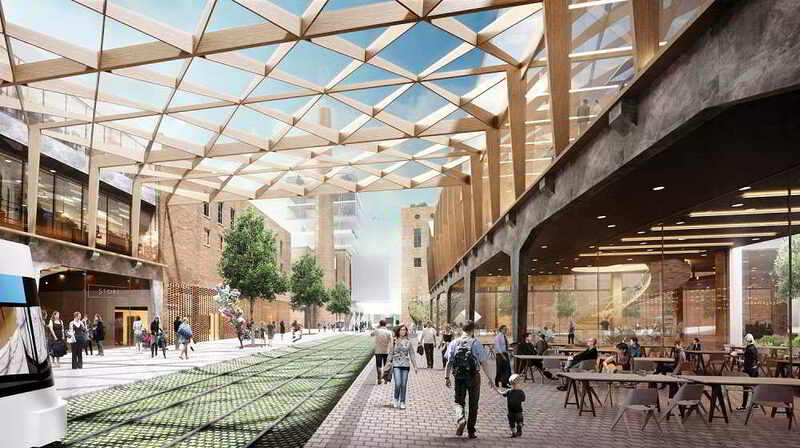 The article depicts the future district in a very positive light: “The residential district being built in Santalahti will have both old red brick buildings and new buildings of different heights, and the idyllic area can be walked through by foot. The industrial buildings will have an essential role in creating the look for the new Santalahti.” The news texts concentrating on Santalahti agree that some old buildings must be saved in one way or another, but that the area is also in desperate need of redevelopment. This narrative dominates the marketing texts and emphasizes the pleasantness of the future neighborhood, completely set in the future time dimension. The future homes are described as warm and welcoming, and the residents can enjoy the parks, the lake, and jogging paths in the natural environments. The Warm, Welcoming Home is a typical narrative, especially in Santalahti. The graffiti storyline is absent. The convenience of location is important to this narrative. On New Santalahti’s webpages, it is told that you as a future resident will be “living conveniently near the services of the city center and moving quickly between the work, errands, and leisure.” It also reminds us that the residents will be on favorable position in regard to the future tramline. The location is also highly visible on the websites of all the major property owners, as well as on the billboards and the flyers of New Santalahti. On the flyer, as seen in Image 7, the residents can enjoy the peace of their own secluded home in the immediate neighborhood of the cardboard factory but may also conveniently go wherever they like – even by tram. Image 7. A section concerning the area of the cardboard factory from the New Santalahti flyer. Nature, the family life, and different activities are well presented. The New Santalahti website also allows its visitors and possible new residents to participate in a survey concentrating on what the Santalahti of their dreams is like. The website emphasizes that everyone is welcome: “[Santalahti] holds thousands of stories, ambiences, and hopes. Come and make your own stories true.” In Image 8, the future residents are urged to find a home in Santalahti. Image 8. “Find Home”. A screenshot of the header banner on the front page of the New Santalahti website. As marketing the new apartments is not yet topical for Hiedanranta, The Warm, Welcoming Home narrative is less present in its materials. In planning texts, Hiedanranta is described as having potential to house thousands of homes with a direct view of the lake, making activities such as boating and tour skating possible for the future residents. The closeness to the lake is further emphasized: “versatile housing will connect naturally with the recreational opportunities and other functions offered by the lake and its shoreline” (City of Tampere 2017c). The versatility is depicted with common saunas, shared gardens and working spaces, playgrounds, and restaurants, all making the life in Hiedanranta appear communal. This sense of community has been one of the main interests in the planning of Hiedanranta and it is also highly visible in the next key narrative. In the news texts, The Warm, Welcoming Home is not a key narrative. This future-based narrative focuses on the stories of communities. It emphasizes the new way of developing a neighborhood: through openness, co-operation, and creating together. 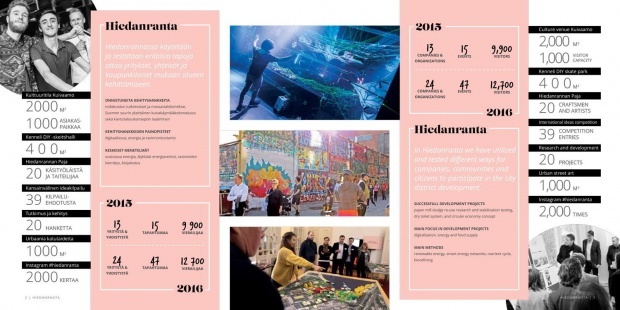 The planning of Hiedanranta relies a lot on participatory and storytelling methods. From the beginning, there have been several events allowing participation in the redevelopment process, such as walking tours, workshops, and garden and planning parties to find out what kind of Hiedanranta people would fall in love with. A booklet about the people of Hiedanranta was published with an aim to give everyone an opportunity to hear what has already been said about the area. The author of the booklet notes that “we have also attempted to give room to diverging views.” The communal themes in the booklet included, for example, nature, preservation and use, an everyman’s shore, and permission to act. The graffiti is also mentioned and present in the booklet, as seen in Image 9. One participator hopes that “there will be activities in the area that are spontaneously spurred [on] by the residents themselves. It doesn’t always need input from the City, just room and permission to act. […] It doesn’t even have to be a big deal; a flower bed, a graffiti wall, a wood workshop or simply permission to be somewhere may be enough” (Kuowi 2016). Many events and activities held in Temporary Hiedanranta have been organized, keeping an eye on the future, and life during the temporary use of the area is utilized as a marketing method for that future. Image 9. “Many have asked for a graffiti wall”. A part of the page 21 from the People of Hiedanranta booklet. Kuowi 2016. This narrative is almost non-existent with the texts concerning Santalahti, excluding the cases in which the lack of community involvement is criticized, usually from the perspective of stakeholders or a disappearing underground culture. For example, the planners were criticized for “not truly listening to stakeholders but only to the landowners” who ordered the plan and claimed that the “municipal democracy or share had no standing in the plan at all.” In a compilation document of opinions and answers regarding the Santalahti draft plan, the planner answered the criticism by denying the accusation and explaining how the targets of both landowners and stakeholders were mapped out in events and authoritative negotiations. They also reminded people that the officially delivered comments have served the use of the planner and the planning consult (“Asemakaavaluonnosten 8048 vaihtoehtoja A ja B koskevat lausunnot / vastaukset” 2013). In a positive light, the community involvement in Santalahti is only mentioned in news texts that focus on the rare occasion of the legal activity in the area. These articles draw a clear line between welcome and unwelcome activity. For example, one article (Koskenniemi 2014) tells a story of airsoft being played in the area with the permission of the landowner. The article describes how the players also keep the area clean, but bemoans the illegal activity and trespassing. The property owner is quoted as saying that his aim is to “weed out the criminal activity” from the lot, thus making room for a key narrative of Ruin and Despair. The Ruin and Despair narrative is based on the present time and is highly more recurrent in the texts of Santalahti. The narrative depicts the idle industrial environment as a run-down center of lawlessness. For example, in a news article about homelessness (Ala-Heikkilä 2017) a man is photographed in the Santalahti area amongst graffiti, as the area was one of the places in which he used to spend nights when he was homeless. The author begins by describing colorfully the match factory area: “Jari Virtanen sits on a couch, pulls a blanket over himself and lies down. Next to his pillow there are used condoms, white goo, and an empty carton of juice. On the floor of the factory there are countless empty beer cans and plastic utensils. The walls are covered in graffiti.” The author uses plenty of details to describe how run-down and desperate the old factory is in order to illustrate the ruinous state in which the homeless man lived in contrast to his current apartment. In this narrative, the graffiti and the people doing it are regarded as having a disorderly nature and as a symbol for ruin, lawlessness, and despair. The narrative is also completely cast away from the future. It is one of the foundations that the Progress and Innovations narrative uses: a shameful past to which the glorious future is compared. The narrative is barely visible in the planning texts of Santalahti and used only once in the texts of Hiedanranta. In these texts the focus is always on progress and improvement in order to move the attention away from Ruin and Despair. Thus, in the marketing texts, this narrative is non-existent. The news texts, however, almost feast on the narrative. In a question posed for readers of Moro, the author takes a clear stand by asking: “Would you be happy if the mess that is Santalahti would be built on soon?” The editorial in the same issue urges people not to make any official complaints about the area’s planning process so that it would finally be built into something better (Manninen 2015b). The narrative is also present in the news articles about arson and accidents that happened in the area during its state of temporary use. One of those news items describes a man dying after he fell from the roof of the roofing felt factory in Santalahti (Koskinen 2016). In another article it was said that “young people spend their time in the area and paint graffiti. […] The industrial area of Santalahti has suffered from vandalism and fires.” According to the interviewed property owner, both the police and the property owners in the area have been powerless in the face of the vandalism. “It can be said that we have been looking on from the side while our properties have been raped, and I speak for all the owners of Santalahti properties,” the property owner is quoted as saying, and he adds that the owners “haven’t complained but gritted [their] teeth” (Haakana 2013b). In this present-oriented narrative, graffiti is viewed as a legitimate art form and as a way of spending time. It only focuses on acceptable forms of producing graffiti art. Illicit graffiti is rarely mentioned and, if it is, it is considered a problem that can be fixed by setting up more legal walls for painting. The narrative is completely missing from the planning and marketing texts concerning Santalahti. In Hiedanranta the legal graffiti, street art, and mural art are celebrated. In the Hiedanranta flyer, as seen in Image 10, the authors have used a photograph taken at the graffiti and street art event Spraycankontrol ’16 to advertise the area with a mention of having a thousand square meters of urban street art. Image 10. A page from the Hiedanranta flyer. 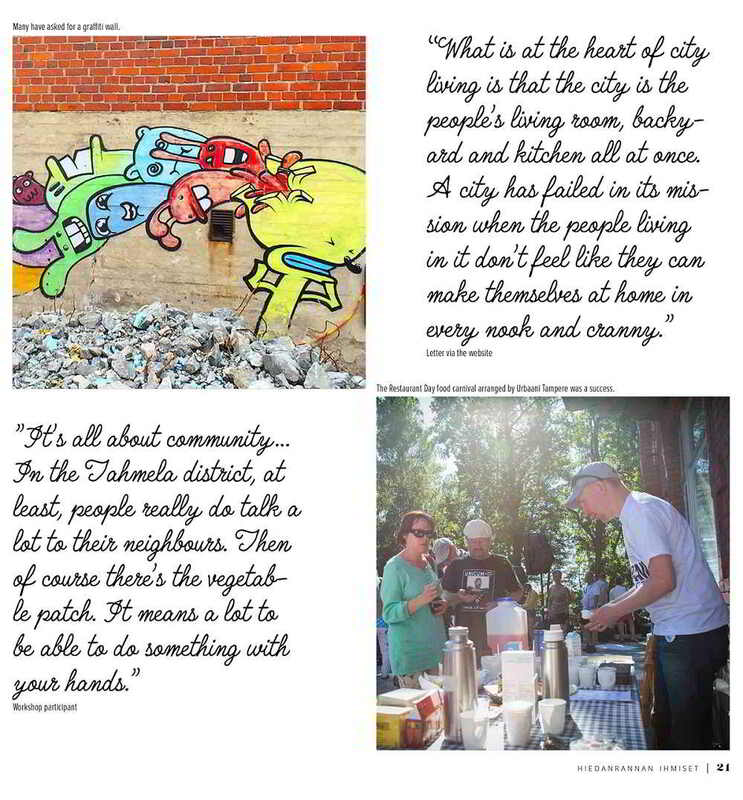 In a short news article (“Hiedanrannassa maalattiin seiniä” 2016) about the same Spraycankontrol event held in Hiedanranta, graffiti and street art are depicted as a positive force. 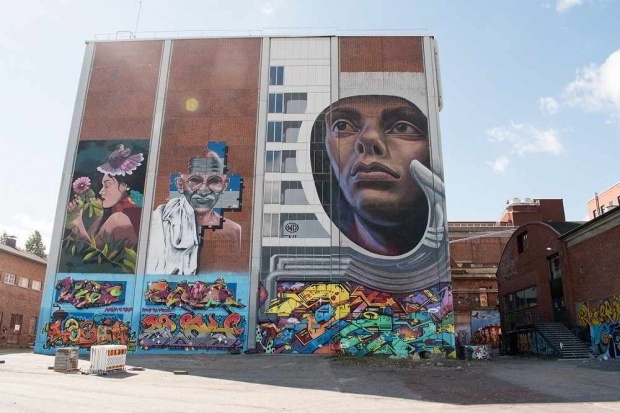 Those who have done the graffiti are described as artists, and a city official “rejoices” about the fact that Hiedanranta is now a “significant street art destination nationwide.” The event was organized with the support of the City of Tampere. In another article, the spokesperson for the Spraycankontrol organization was interviewed about legal graffiti walls. The article also includes a critical viewpoint of the destruction of the Santalahti graffiti: “It’s a shame that the city [of Tampere] did not think much of the young people when developing the area of the match factory,” the spokesperson says. He notes that the area of Santalahti had the potential to be redeveloped into a place for youth culture. He also mentions Hiedanranta as a potential replacement for the Santalahti area, thus linking the two areas together. In this article, graffiti is seen mostly as a hobby that needs legal outlets, especially for young people. The spokesperson also describes graffiti as an art form, hoping that city officials would see how graffiti could enliven the cityscape (Oikari 2017). The last key narrative illustrates the underground culture in the two areas in a positive, approving, and slightly romanticized manner. The narrative is completely missing from both the planning and marketing texts of Santalahti but is present in the planning texts of Hiedanranta as one layer of the Together with Communities narrative that focuses on communal activity. The Underground narrative is the most visible in the news texts concerning both areas. The articles concerning Santalahti include criticism towards the redevelopment of the area, as it will inevitably destroy the famous graffiti center, often referenced by the name the Pispala Gallery. In an interview of a fiction author, she is set against the backdrop of Santalahti as it was one of the places she frequented during the writing process of her book. The author writes that “[t]he area has been planned as a residential area but rounds of official complaints have kept the houses under the reign of underground cultures. For the graffiti enthusiasts, the Pispala Gallery has been a semi-legal place to do their art” (Lehtinen, N. 2017). This criticism is also offered in a large article that trails the development of Tampere from the past to the future, detailing its major milestones and projects. A researcher from Museum Center Vapriikki raises concern about the Santalahti area. “If the old buildings could remain as a place for graffiti, they could be a huge attraction for young people in the future,” he suggests, “We could ask the young people what they want” (Roth 2016d). In another article (Roth 2016a) by the same author, graffiti artists operating unauthorized in Santalahti are interviewed. This article depicts the area as a rare, culturally rich meeting point of underground cultures. The author details the difficulties of sustaining or protecting the wide underground graffiti culture in Santalahti. Additionally, one article suggests that because of the redevelopment in Santalahti, half of the famous historical working-class district of Pispala, to the south of Santalahti, is on the verge of disappearing. The author has interviewed anonymous graffiti artists, explaining how the area comes to life at night and how it is visited by people from all over the country. “This is a very nice place,” one visitor is described as saying about the two eastern factory blocks covered in graffiti in Santalahti. The point of view is very clearly about the preservation of the area, emphasizing the quality of the graffiti pieces and the sense of community in the area (“Puolet Pispalaa uhkaa kadota” 2014). Whereas news texts featuring Santalahti use this narrative as a form of criticism towards the lack of interest in acknowledging the subcultures of Santalahti during the planning process, the Hiedanranta articles use it to illustrate the identity of Temporary Hiedanranta. For example, in one article (Jokelin 2017) Hiedanranta is depicted as rough but beautiful and as a place with “some deliberate bleakness and a sense of abandoned buildings, but in a cool, hipster sort of way.” In this narrative, the Hiedanranta area is described as a culture hub, celebrating the urban subcultures. Of the seven key narratives, the graffiti storyline is absent in one (The Warm, Welcoming Home), passive in two (Progress and Innovations, The Old with the New), and active in four (Together with the Communities, Ruin and Despair, Graffiti as Art and a Pastime, The Underground), of which only one is future-oriented. The other three concentrate on the criticism (Santalahti) or celebration (Hiedanranta) of the present day relations of planning and graffiti storyline. None of the narratives promise that after the two areas’ transition from their temporary use to their future residential use the graffiti storyline would still continue – although the incomplete planning story of Hiedanranta seems to be flirting with the idea. The most critical of the narratives, the Underground, can also be seen weaved through as an undertone in the whole of my study. This is because I have chosen to focus on the graffiti storyline, which manifests itself most clearly in the criticism towards the disinterest in acknowledging the heritage of graffiti culture in the planning process of Santalahti and in the prospect of developing Hiedanranta. However, even though the dominant narratives of Hiedanranta speak of the high involvement of urban subcultures, this might be just due to the incompleteness of the case. The planning process is not immune to possible pitfalls in the future, such as gentrification through arts uses which usually concerns districts definable by some form of specific appropriation or characteristics (Miles 1997, 107) and there seems to be a need to develop this kind of strong identity for Hiedanranta. In addition to the previously mentioned three main differences between the two areas, Hiedanranta does not have a history of graffiti like Santalahti does. This means that the planners did not need to make decisions regarding the future of said culture. Instead, the City of Tampere has been able to create something temporary with which to carefully experiment during the planning process. This is partly due to the city’s increasing interest in redeveloping vacant and indeterminate sites in the Tampere region. For example, in the Urban Fallows research project originated in Tampere University of Technology and initiated under Creative Tampere (a City of Tampere business development programme for the years 2006–2011), researchers developed methods for mapping indeterminate spaces as resources in response “to the demands of cultural actors searching for spaces in which to pursue their activities” (Ylä-Anttila 2010, 13). The researchers were also involved in various planning and development processes in order to create alternative redevelopment models for the reuse of vacant spaces (Ylä-Anttila 2010, 13). Hiedanranta has been subject to this type of interest. The graffiti storyline connected to Santalahti and Hiedanranta is a common one. The same questions and problems concerning the stories and heritage of graffiti culture have been discussed all over the world. In the Nordic countries recent urban development projects – such as the ongoing redevelopment of an idle parking hall in Bergsjö (Gothenburg, Sweden), the former coal depot in Sydhavnen (Copenhagen, Denmark), or the now-demolished Hjartagarðurinn park in the center of Reykjavík (Iceland) – have all had to deal with these narratives of urban planning concerning the active graffiti culture operating in the area. Selecting the perspective of urban planning is always a crucial decision. It is important to discern what is included in the narrative fabric of the area under planning as it may be something as unexpected as a graffiti storyline. Acknowledging the existence of these types of storylines is required at the very least for planners to be able to decide between the inclusion and exclusion of that specific storyline: Should this storyline continue at this specific place in the future? Through what kind of narrative should it be represented to the public? And even more importantly, what happens if it is decided that the storyline should be cut here? The decision of inclusion or exclusion should always be conscious and justifiable as it is not only targeting phenomena per se but communities behind them. All the made decisions, as well as the possible absence of some, are visible in the planning stories and, therefore, as Throgmorton writes, the materials produced in planning as narrative objects “shape meaning and tell readers (and listeners) what is important and what is not, what counts and what does not, what matters and what does not” (Throgmorton 2003, 128). Storytelling is always selective, and narratives always have consequences. In this study, I have approached two post-industrial case areas undergoing planning in the city of Tampere: Santalahti and Hiedanranta. Both areas are currently in temporary use: a state between their former industrial use and redevelopment for the new residential use. I have approached storytelling as a model for and of planning and analyzed seven interwoven key narratives identified in planning, marketing, and news texts, by which the present and the future of the two areas have been communicated to the public from 2013 to 2017. The narratives were analyzed from the perspective of storylines that involves the graffiti culture operating in both areas in recent years, completely unauthorized in Santalahti but supported by the City of Tampere in Temporary Hiedanranta. The most dominant narratives of both areas concentrate on the future by illustrating the progress and the change through sustainability and innovations and by emphasizing the use of historical buildings as a resource of redevelopment. The graffiti storyline is most clearly visible in three narratives, in one of which it is under scrutiny as a symbol for disorderly lawlessness in the Santalahti area. The two other narratives focus on graffiti as a legitimate art form and culture, and maintain that graffiti itself has inherent value. Even though these two minor narratives focus only on the present state of the areas, they nevertheless include the stories from within the graffiti culture. This study exemplifies the complexity of the narrative fabric in urban planning, but lacks being able to offer insight into how to include graffiti storylines as a part of the future and especially into how the possible value in them could be better identified. Therefore, the vital question of recognizing and acknowledging the stories and heritage of graffiti culture in spaces of temporary use remains for future studies. All links verified 4 June 2018. A-Insinöörit Suunnittelu Oy. ”Voimalinjakaapelisovitus.” 2 June 2014. Arkkitehdit LSV. ”Aluejulkisivu.” 25 September 2013a. Arkkitehdit LSV. ”Havainnekuva.” 3 June 2014b. Arkkitehdit LSV. ”Paikoituskaavio.” 20 January 2013c. Arkkitehdit LSV. ”Pelastustiekaavio.” 17 September 2013d. Arkkitehdit LSV. ”Varjoanalyysi.” 23 September 2013e. ”Asemakaavaluonnosten 8048 vaihtoehtoja A ja B koskevat lausunnot / vastaukset.” 8 February 2013. ”Asemakaavaluonnosten 8048 vaihtoehtoja A ja B koskevat mielipiteet / vastaukset.” 8 February 2013. ”Asemakaavan seurantalomake.” 18 December 2015. FCG Finnish Consulting Group Oy. ”Hulevesiselvityksen liite.” 11 October 2013a. FCG Finnish Consulting Group Oy. ”Santalahden asemakaava-alueen hulevesiselvitys.” 11 October 2013b. FCG Suunnittelu ja tekniikka Oy. ”Yhteenveto Santalahden alueen pilaantuneisuudesta.” 08 July 2013. ”Hyväksyttävä asemakaava.” 10 June 2014. ”Pirkanmaan rataverkon kehittämisen liikenteellinen tarveselvitys.” 2013. ”Poistettava asemakaava.” 15 December 2014. Ramboll Finland Oy. ”Santalahden asemakaavan meluselvitys, päivitys.” 30 May 2014. Ramboll Finland Oy. ”Viheryleissuunnitelma.” 1 October 2013. ”Santalahden asemakaavaehdotusta 8048 koskevat lausunnot.” 3 June 2014. ”Santalahden asemakaavaehdotusta 8048 koskevat muistutukset ja vastaukset.” 3 June 2014. ”Santalahden asemakaavan liikenneselvityksen 8/2013 liitteet”. August 2013. Seppänen, Jouko. ”Asemakaavaehdotuksen selostus.” 10 June 2014a. Seppänen, Jouko. ”Asemakaavaehdotuksen selostus: kaava nro 8048.” 15 December 2014b. Seppänen, Jouko. ”Santalahden asemakaavatyön näkymätarkasteluiden kooste.” 14 November 2013. Seppänen, Jouko, and Maija Villanen. ”Kortteliohje.” 10 June 2014. SITO Tampere Oy. ”Santalahden asemakaavan liikenneselvitys.” August 2013. Tampereen kaupunkikuvatoimikunta. ”Lausunto Santalahden asemakaavaehdotuksesta.” 11 March 2014. ”Viranomaisneuvottelun muistio.” 6 March 2014. City of Tampere. ”Arvostelupöytäkirja: Tampereen Hiedanrannan kaupunginosan kansainvälinen ideakilpailu.” 2016a. City of Tampere. ”Hiedanrannan työpajataulut.” 2017a. City of Tampere. ”Hiedanrannan yleissuunitelman runko.” 2017b. City of Tampere. “Hiedanranta Landscape Survey.” 2016b. City of Tampere. “The Objectives for the local master plan for the inner city 2040.” 2015. City of Tampere. ”Kilpailuohjelma. Tampereen Hiedanrannan kaupunginosan kansainvälinen ideakilpailu.” 2016c. Heiskanen, Jari, and Kirsi Niukko. ”Hiedanrannan rakennetun ympäristön selvitys: Harjun ja veden maisema, Lielahden tehdasalueen historialliset kerrostumat, rakennukset ja kulttuuriarvot.” 2015. ”Hiedanranta arkkitehtikilpailua varten Raitiotien suunnitteluperusteita.” 2016. Hukkanen, Heikki and Matti Holopainen. ”Technical Area Description Of Hiedanranta.” 2016. Lehtovuori, Panu et al. ”Development Vision for Hiedanranta: Densely-built and Intensively Green Tampere City West.” 2016. Pirkanmaa Provincial Museum. ”Arkeologinen inventointi.” 2015. Rahkonen, Riikka, and Jouko Seppänen. ”Rakennetun ympäristön selvitys.” 2016. ”Vaitinaron liikenne- ja liittymäselvitys, yhteenveto.” 2016. Billboard of the New Santalahti [a]. Billboard of the New Santalahti [b]. Flyer of the New Santalahti. Lemminkäinen. ”Santalahdessa kotisi on keskustassa järvinäkymin.” http://www.lemminkainen.fi/asunnot/asuntohaku/tampereen-santalahti. 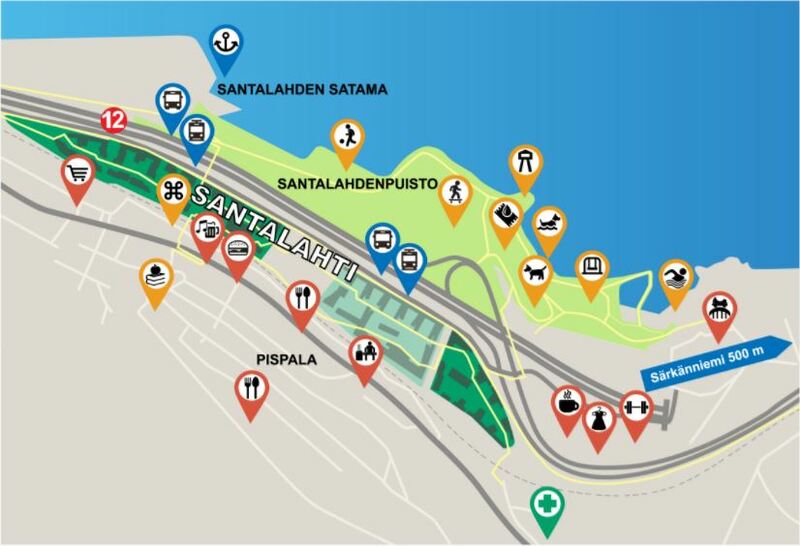 Map of the New Santalahti. Pohjola Rakennus. “Uusia koteja suunnitteilla Santalahteen”. http://www.pohjolarak.fi/kohteet. Pohjola Rakennus, and YH Kodit. http://www.uusisantalahti.fi. ”Tulevaisuuden kohteita yhdistävät hyvät sijainnit.” Arvoa asiakkaalle: Pohjola Rakennus Oy:n asiakaslehti, 1/2014. Tampere: Pohjola Rakennus Oy. https://issuu.com/mainio/docs/arvoaasiakkaalle_netti_31d86f7548d738. ”Uusi toimisto ja mittavia hankkeita.” Arvoa asiakkaalle: Pohjola Rakennuksen asiakaslehti, 2017. Tampere: Pohjola Rakennus Group PRG Oy. https://issuu.com/mainio/docs/arvoa_asiakkalle_2017_issuu. YH Kodit [a]. “Tampereen Santalahti.” https://www.yhkodit.fi/kotia-etsivalle/suunnitteilla-olevat-kohteet/santalahti. YH Kodit [b]. ”YH Kodit ja Pohjola Rakennus rakentavat Tampereen Santalahteen 500 asuntoa.” https://www.yhkodit.fi/uncategorized/yh-kodit-pohjola-rakennus-rakentavat-tampereen-santalahteen-500-asuntoa. ”2 300 asukkaan asemakaava Santalahteen.” Aamulehti. June 11, 2014. Airaksinen, Annastiina. ”Hiedanrannan pioneerit luovat uutta kaupunginosaa.” Aamulehti. June 17, 2016. Airo, Tatu. ”Hiedanrantaan jopa 25 000 asukkaan kaupunginosa.” Aamulehti. October 13, 2016. Airo, Tatu. ”Ratikka jatkoon.” Aamulehti. August 6, 2017a. Airo, Tatu. ”Valtava alue Näsijärvestä täytetään.” Aamulehti. July 14, 2017b. Ala-Heikkilä, Minna. “Vihdoin kotona.” Aamulehti. July 16, 2017. Haakana, Tuomas. “Hylätyssä tehtaassa paloi taas kokko Pispalassa.” Aamulehti. July 9, 2013a. Haakana, Tuomas. ”Tikkutehtaan omistaja: rötisköt ovat kaavoitusbyrokratian tuote.” Aamulehti. December 28, 2013b. Heinänen, Liisa. ”Palo tuhosi teollisuushistoriaa.” Aamulehti. November 12, 2014. ”Hiedanrannan suunnittelukisan voitosta 110 000.” Aamulehti. April 25, 2016. ”Hiedanrannan voitto jaettiin kahdelle työlle.” Tamperelainen. January 11, 2017. ”Hiedanrannan yleissuunnittelu on alkanut.” Tamperelainen. June 3, 2017. ”Hiedanrannassa maalattiin seiniä.” Tamperelainen. August 24, 2016. ”Hiedanranta hurmasi kävijät.” Aamulehti. August 16, 2015. ”Hiedanrantaa ideoidaan avoimissa työpajoissa.” Tamperelainen. April 8, 2017. ”Hiedanrantaan tulossa kelluva sauna.” Tamperelainen. May 17, 2017. ”Hiedanrantaan tutustui yli 7 000 vierasta.” Aamulehti. August 18, 2015. ”Huimat graffitimaalaukset koristavat Hiedanrantaa.” Aamulehti. August 25, 2016. Huovinen, Jorma. ”Palaneen tehtaan ydinosa säästynee.” Aamulehti. November 13, 2014. Husa, Mikko. ”Tukku uusia festareita ja Kuivaamo.” Aamulehti. May 24, 2016a. Husa, Mikko. ”Uusi Kuivaamo pääsee tositestiin.” Aamulehti. June 15, 2016b. Högmander, Jutta. ”Lielahteen voisi joskus nousta tornitaloja ja Tampereen Riviera.” Aamulehti. July 19, 2013a. Högmander, Jutta. ”Suljettu tehdasalue odottaa uutta elämää.” Aamulehti. July 14, 2013b. Högmander, Jutta. ”Tehtaiden kaupungin tarina jatkuu.” Aamulehti. February 25, 2016a. Högmander, Jutta. ”Villit visiot.” Aamulehti. April 3, 2016b. Jokelin, Jantso. ”Uusi Tampere kajahti käyntiin betonin keskellä.” Aamulehti. July 16, 2017. Kalliosaari, Kati. ”Hiedanrannassa toimistotkin voivat kellua.” Aamulehti. March 12, 2016. Kalliosaari, Kati. ”Raitiovaunu ajaa tehtaan läpi Hiedanrannassa.” Aamulehti. January 11, 2017a. Kalliosaari, Kati. ”Tampereen Hiedanrannan ideakilpailu ratkeaa tänään.” Aamulehti. January 10, 2017b. Kangasvieri, Fanni. ”Skeittaava koira Rambo hurmaa etenkin lapsiyleisön.” August 5, 2017. ”Kauneus kohtaa rumuuden.” Aamulehti. July 18, 2014. Koivu, Viivi. ”Santalahti on yhä vailla kaavaa.” Moro. May 29, 2014. Koskenniemi, Aila. ”Softaajat siivoavat tikkutehtaan tonttia.” Aamulehti. April 23, 2014. Koskinen, Anu Leena. ”Mies putosi katolta ja kuoli.” Aamulehti. June 1, 2016. Kuusela, Matti. ”Kaikkien aikojen romanttisin kosinta.” Aamulehti. May 20, 2017. Lehtinen, Juha. ”Purkutöihin päästäneen ensi kesänä.” Aamulehti. November 11, 2014. Lehtinen, Nina. ”Mieli liikkuu.” Aamulehti. February 5, 2017. ”Lielahden piippu uhkaa sortua.” Moro. July 16, 2015. ”Lielahden vanha tehdasalue valaistaan.” Tamperelainen. December 12, 2015. ”Lielahti kasvussa.” Tamperelainen. August 24, 2016. “Liki 40 tahoa kilpailee Hiedanrannan ideoinnista.” Tamperelainen. October 15, 2017. Manninen, Jukka. ”Onneksi Santalahteen on luvassa rantaparatiisi.” Moro. March 26, 2015a. Manninen, Jukka. ”Pienyrittäjät joutuvat pois pahvitehtaasta.” Moro. August 3, 2017a. Manninen, Jukka. ”Santalahdessa asuu kohta 2 300 tamperelaista.” Moro. April 20, 2017b. Manninen, Jukka. “Santalahteen voisi rakentaa 8-kerroksisia asuintaloja.” Moro. October 31, 2013. Manninen, Jukka. ”Tervetullut parannus.” Moro. April 20, 2017c. Manninen, Jukka. ”Älä valita Santalahdesta.” Moro. March 26, 2015b. Metsähalme, Freija. ”’Lielahti olisi kuin Dubai.” June 14, 2014. Mylläri, Jari. ”Pahvitehtaan firmoille saatava tilat.” Moro. August 3, 2017. Mäkinen, Petteri. ”Hervannallinen uusia asukkaita Lielahteen.” Tamperelainen. February 7, 2015. Mäkinen, Petteri. ”Uittotunneli jäämässä kauaksi rannasta.” Tamperelainen. July 12, 2017. Mäkinen, Petteri. ”Uusille asuinalueille pyörätie.” Tamperelainen. March 30, 2016. Määttänen, Markus. ”Tulevaisuus avautuu.” Aamulehti. November 15, 2017. Nieminen, Iida. ”Kivulias laji vaatii paljon harjoittelua.” Aamulehti. August 8, 2017. Nyman, Juhana. ”Tehtaan piippu uhkaa sortua Lielahdessa.” Aamulehti. June 30, 2015. Oikari, Joel. ”Spray-maalausta harrastaa moni, mutta missä..?” Tamperelainen. August 5, 2017. ”Olisitko iloinen, jos Santalahden rytöpesän rakentaminen alkaisi nopeasti?” Moro. March 26, 2015. Pelkonen, Roosa. ”Kiva, että tikkutehdasta käytetään luvalla.” Tamperelainen. May 10, 2014. Pesonen, Heidi. ”Lielahden uusi asutus voi tulla tekosaarille.” Aamulehti. June 13, 2014. Pesonen, Heidi. ”Pala tukkilaiskulttuuria tuhoutui Tampereella.” Aamulehti. April 23, 2015. ”Pirkanmaan pulssi.” Aamulehti. April 26, 2015. ”Pirkanmaan pulssi.” Aamulehti. December 12, 2014. Pokkinen, Jorma. ”Kaavoihin kangistuneet.” Aamulehti. July 28, 2013. ”Puolet Pispalaa uhkaa kadota.” Aamuleht July 18, 2014. Roth, Raili. ”Graffitien mestarit.” Aamulehti. August 15, 2016a. Roth, Raili. ”Hiedanranta kehittyy Tanskan tyyliin.” Aamulehti. May 11, 2017. Roth, Raili. ”Lielahti sai puita ja kanaaleita.” Aamulehti. April 30, 2016b. Roth, Raili. ”Matka Suomen Dubaiksi.” Aamulehti. December 4, 2016c. Roth, Raili. ”Puoliksi luvallista taidetta.” Aamulehti. September 11, 2016d. Rouvinen, Talvi. ”Pispalan feimi katoaa uuden asuinalueen tieltä.” Moro. August 6, 2015. Ruissalo, Pekka. ”Hiedanrannan alueella menee nyt lujaa.” Tamperelainen. May 31, 2017. Ruissalo, Pekka. ”Hiedanranta vakuutti tamperelaiset.” June 6, 2016. Rämö, Marjo. ”Lielahden tehdasalue avautuu yleisölle.” Tamperelainen. June 29, 2016. Saarinen, Jussi. ”Lielahden pimeydestä löytyi helmi.” Aamulehti. November 21, 2016a. Saarinen, Jussi. ”Mansen Suvilahti.” Aamulehti. June 16, 2016b. Saarinen, Jussi. ”Vapaa kulttuuri jäi valtatien alle.” October 11, 2016c. ”Santalahteen esillä 2 300 asukkaan kerrostalot.” Aamulehti. November 6, 2013. Särkiniemi, Emilia. ”Lielahti, harmaa autoilijoiden kaupunginosa.” Aamulehti. February 13, 2016. ”Tampereen Hiedanrannassa pidetään juhlat.” Aamulehti. August 14, 2015. Tanner, Suvi. ”Lielahden tehdasalueelle asuntoja ja työpaikkoja.” Aamulehti. January 31, 2014. Taponen, Aki. ”Tampereen Santalahteen tulee yli 2 000 asukkaan kaupunginosa.” Aamulehti. December 15, 2015a. Taponen, Aki. ”Tehdasalue sai uuden nimen.” Aamulehti. May 28, 2015b. Taponen, Aki. ”Tulitikkutehtaan kortteliin päiväkoti ja kerrostaloja.” Aamulehti. May 4, 2014. ”Teollisuusalueella Tampereella paloi tällä kertaa sohva.” Aamulehti. December 3, 2014. Tolonen, Anni. ”Olympiatason skeittihalli avautuu pian Tampereelle.” Aamulehti. May 12, 2017. ”Tulitikkutehtaalla syttyi tulipalo sunnuntaiyönä.” Aamulehti. April 22, 2014. Tunturi, Saara. ”Meidän rantamme.” Aamulehti. April 17, 2016. Tuominen, Nette. ”Ylväs ja ronski Hiedanranta avaa porttinsa.” Aamulehti. August 15, 2015. Uusitalo, Kaisa. ”Kuivaamo on uusi kulttuuritila tehdasmiljöössä.” Aamulehti. June 17, 2017a. Uusitalo, Kaisa. ”Suojellulle Santalahdelle on suuria suunnitelmia.” Aamulehti. July 3, 2017b. Välinoro, Anne. ”Hiedan tulevaisuus.” Aamulehti. June 11, 2016. Alves, Alice Nogueira. 2017. “Why Can’t Our Wall Paintings Last Forever? The Creation of Identity Symbols of Street Art,” Street Art & Urban Creativity Scientific Journal 3 (1): 12–18. Avery, Tracey. 2009. “Values not Shared. The Street Art of Melbourne’s City Laneways.” In Valuing Historic Environments, edited by John Pendlebury and Lisanne Gibson. London: Routledge. Bulkens, Maartje, Claudio Minca and Hamzah Muzaini. 2015. “Storytelling as Method in Spatial Planning,” European Planning Studies 23 (11): 2310–2326. Taylor & Francis. Childs, Mark C. 2008. “Storytelling and Urban Design,” Journal of Urbanism. International Research on Placemaking and Urban Sustainability 1 (2): 173–186. Taylor & Francis. Colomb, Claire. 2012. “Pushing the Urban Frontier. Temporary Uses of Space, City Marketing, and the Creative City Discourse in 2000S Berlin,” Journal of Urban Affairs 34 (2): 131–152. Wiley. Currie, Gregory. 2010. Narratives and Narrators. A Philosophy of Stories. Oxford: Oxford University Press. Doron, Gil M. 2000. “The Dead Zone and the Architecture of Transgression,” City 4 (2): 247–263. Taylor & Francis. Eckstein, Barbara J. 2003. “Making Space. Stories in the Practice of Planning.” In Story and Sustainability. Planning, Practice, and Possibility for American Cities, edited by Barbara Eckstein and James A. Throgmorton, 13–36. Cambridge: The MIT Press. Finnegan, Ruth. 1998. Tales of the City. A Study of Narrative and Urban Life. Cambridge: Cambridge University Press. Forester, John. 1999. The Deliberative Practitioner. Encouraging Participatory Planning Processes. Cambridge: MIT Press. Groth, Jacqueline and Eric Corijn. 2005. “Reclaiming Urbanity. Indeterminate Spaces, Informal Actors and Urban Agenda Setting,” Urban Studies 42 (3): 503–526. SAGE Publications. Haydn, Florian and Robert Temel (eds.). 2003. Temporary Urban Spaces. Concepts for the Use of City Spaces. Berlin: Birkhäuser. Kimvall, Jacob. 2013. “FASCINATE(!) Graffiti as Artwork and Contested Cultural Heritage in the Public Space,” Critical Legal Conference at Queens University, Belfast. Lehtovuori, Panu and Sampo Ruoppila. 2012. “Temporary Uses as Means of Experimental Urban Planning,” Serbian Architectural Journal 4 (1): 29–53. University of Belgrade. Lieblich, Amia, Rivka Tuval-Mashiach, and Tamar Zilber. 1998. Narrative Research. Reading, Analysis and Interpretation. Thousand Oaks: Sage. Phoenix, Ann. 2008. “Analysing Narrative Contexts.” In Doing Narrative Research, edited by Molly Andrews, Corinne Squire, and Maria Tamboukou, 64–77. London: SAGE Publications. MacDowall, Lachlan. 2006. “In Praise of 70K. Cultural Heritage and Graffiti Style,” Continuum. Journal of Media and Cultural Studies 20 (4): 471–484. Routledge. MacDowall, Lachlan. 2017. “Cultural Heritage and the Ficto-Critical Method. The Ballad of Utah and Ether,” Street Art & Urban Creativity Scientific Journal 3 (1): 106–109. Mandelbaum, Seymour. 1991. “Telling stories,” Journal of Planning Education and Research 10 (3): 209–214. SAGE Publications. Merrill, Samuel. 2014. “Keeping It Real? Subcultural Graffiti, Street Art, Heritage and Authenticity,” International Journal of Heritage Studies 21 (4): 369–389. Taylor & Francis. Miles, Malcolm. 1997. Art, Space and The City. Public Art and Urban Futures. London: Routledge. Nomeikaite, Laima. 2017. “The Wall is Dead, Short Live Graffiti and Street Art! Graffiti, Street Art and the Berlin Wall’s Heritage,” Street Art & Urban Creativity Scientific Journal 3 (1): 43–53. Sandercock, Leonie. 1998. Towards Cosmopolis. Planning for Multicultural Cities. New York: Wiley. Sandercock, Leonie. 2005. “Out of the Closet. The Importance of Stories and Storytelling in Planning Practice.” In Dialogues in Urban & Regional Planning, edited by Bruce Stiftel and Vanessa Watson, 299–321. New York: Routledge. Skalin, Lars-Åke. 2008. “Telling a Story. Reflections on Fictional and Non-Fictional Narratives.” In Narrativity, Fictionality, and Literariness. The Narrative Turn and the Study of Literary Fiction, edited by Lars-Åke Skalin, 201–260. Örebro: Örebro University. Throgmorton, James A. 1993. “Planning as Persuasive Storytelling in the Context of ‘the Network Society’,” Planning Theory 2 (2): 125–151. SAGE Publications. Throgmorton, James A. 1996. Planning as Persuasive Storytelling. The Rhetorical Construction of Chicago’s Electric Future. Chicago: University of Chicago Press. Throgmorton, James A. 2003. “Planning as Persuasive Storytelling in a Global-Scale Web of Relationships,” Planning Theory 2 (2): 125–151. SAGE Publications. Van Dijk, Terry. 2011. “Imagining Future Places. How Designs Co-constitute What Is, and Thus Influence What Will Be,” Planning Theory 10 (2): 124–143. SAGE Publications. Van Hulst, Merlijn. 2012. “Storytelling, a Model of and a Model for Planning,” Planning Theory 11 (3): 299–318. SAGE Publications. Ylinen, Kai. 2015. “Pispalan feimi. Turvaton maisematahra vai kulttuuriympäristö?” Master’s thesis. University of Jyväskylä. Ylä-Anttila, Kimmo. 2010. “Refining the Method. Learning From Action Research.” In Urban Fallows. Transformations & Breeding Grounds, edited by Kimmo Ylä-Anttila, 13–23. Tampere: Tampere University of Technology. According to the email sent to the author on 22 August 2017 by Harri Kiviranta, a Project Development Manager of Pohjola Rakennus Oy, more marketing materials of New Santalahti should be available later in Autumn 2017 as the development proceeds. Since this article has been written before that, the future materials unfortunately could not be analyzed. Aamulehti is a paid daily newspaper owned by Alma Media Oyj, published in Tampere, and serving mostly the Pirkanmaa region. Moro is a weekly supplement of Aamulehti, distributed free of charge on Thurdays. Tamperelainen is a free local newspaper issued twice a week and owned by Etelä-Suomen Media Oy, a part of media concern Keskisuomalainen Oyj. Quotes translated from Finnish to English by the author Kai Ylinen.